For the first time in its history, Dinan is unveiling numerous carbon fiber aesthetic trim pieces starting with the F8x chassis’ (M2, M3, M4). While the basis to start the program is rooted in more universally oriented pieces (mirror caps, grilles, spoilers) they are the foundation of the Dinan aesthetic; clean, simple and accentuating. No one piece defines the car. They simply make it better as a whole. Help your car stand out from the crowd with Dinan’s clear coated carbon fiber mirror caps that provide a unique aesthetically pleasing high tech appearance. Our mirror covers, unlike most, are full replacements complete with a molded fastening system for quck and easy installation and not simply overlays. 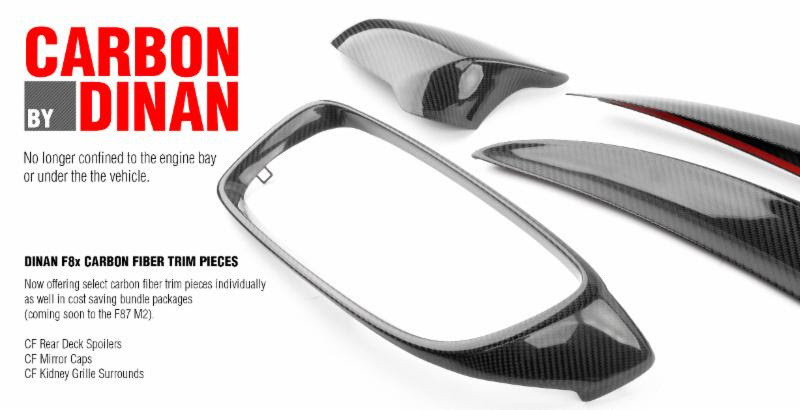 You will be sure to impress with Dinan’s CF mirror covers on your ride! With Dinan’s carbon fiber kidney grille surrounds one of the most iconic elements of your BMW can be transformed into something even more special. Built for easy installation the CF kidney grille surrounds utilize the same locking tabs the factory parts use for a seamless and clean installation. Add a splash of style with Dinan’s carbon fiber rear deck spoiler for the F8x M2/M3/M4. A quintessential aesthetic modification for any high performance show build, the carbon fiber spoiler emanates sophistication and purpose. 2 qualities synonymous with the Dinan brand.